Renee's story began in 2007 when she was suffering from depression, insomnia and fatigue, as well as a large cyst/tumor it required surgery to remove. Her family was also dealing with illnesses, from immune issues and fatigue in her 12 year old daughter Kelley and depression, low self-esteem, and excessive drinking with 17 year old Shauna. Her mother, Donna, was dealing with cancer. Renee felt powerless and hopeless until she heard about the raw food diet, and decided to use this diet to attempt to heal her body and her family. She realized was that they all shared one common factor; their diets all consisted of the SAD American diet, which included a lot of fast food and snickers bars. "She realized that they all shared one common factor; their diets all consisted of the SAD American diet, which included a lot of fast food and snickers bars." Renee started spending a lot of time on the west coast learning about raw food/plant based diet, juicing and cleansing her body. That year, everything changed for her family—everyone took turns flying out to the west coast learning and juicing. The results were miraculous. All of their illnesses disappeared! Renee knew this diet would have to be permanent to continue with the results and a better life, so she started looking into how she could create fun foods that they would all be excited about. And that is where Renee’s Raw Chocolate was birthed; a raw healthy chocolate that tastes just like a snickers bar! 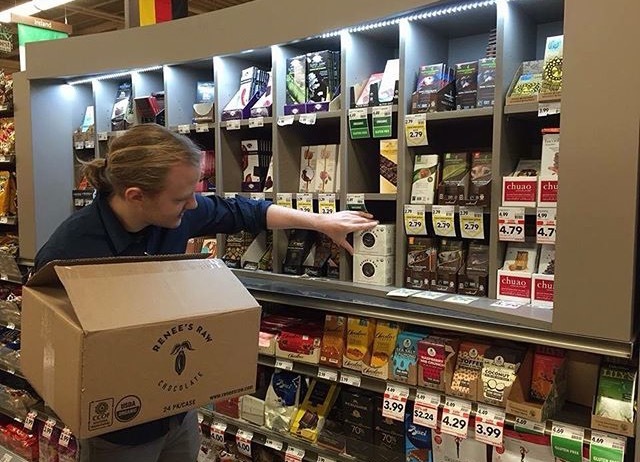 Today, Renee's Raw Chocolate is in 22 stores in the Chicago area and working on going Nationwide with Whole Foods over the coming years.